A star-studded cast performed for the PBS broadcast of the National Memorial Day concert Sunday, May 28th. This year, the National Memorial Day Concert honored Captain Luis Avila, a military policeman severely injured after an IED explosion. During the performance segment, featuring acclaimed singer Renée Fleming, a special moment was dedicated to the importance of music therapy services for Captain Avila and all veterans. Captain Avila and music therapist, Rebecca Vaudreuil, joined Ms. Fleming on stage to recognize the importance of music therapy in the rehabilitation of America's veterans. The concert was broadcast live on PBS as well as to our troops serving around the world on the American Forces Network. The American Music Therapy Association is appreciative for Ms. Fleming's support of music therapy. 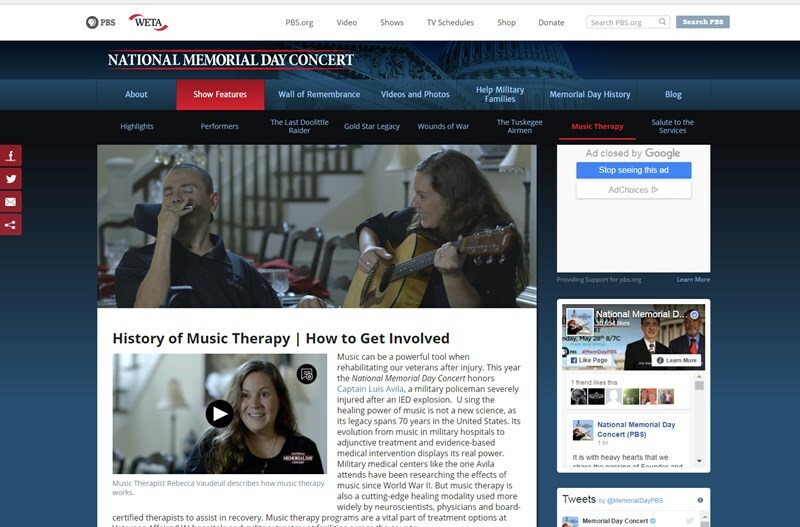 You can watch the segment on Captain Avila below or go to the PBS website for the whole rebroadcast of this amazing concert and a section of the concert's website dedicated to music therapy. And to all our veterans, thank you for your service.